UP TO 1,000 people marched in Ferbane today to protest a decision by Ulster Bank to close the only bank in the town. The Offaly branch is one of 14 Ulster Bank have earmarked for closure with the doors due to shut in March 2015. Campaigners say that, after nearby branches in Shannonbridge, Cloghan and Kilcormac were closed, account holders moved to Ferbane were told the branch’s future was safe. Pat O’Callaghan, from an action group set up to save the branch, told TheJournal.ie that Ulster Bank customers in Ferbane and the surrounding hinterland have been told that their accounts are being moved to Athlone, some 20km away. O’Callaghan says that the bank’s closure would be “a huge blow to the community” adding that it has been there since 1919. A meeting between campaigners and Ulster Bank representatives held earlier this week involving TDs Marcella Corcoran Kennedy and Barry Cowen concluded without progress. The marchers in Ferbane assembled outside Ulster Bank to hear speakers demand a meeting with Ulster Bank CEO Jim Brown. O’Callaghan said that the group’s protests are “only getting started” with a demonstration at Ulster Bank’s Dublin HQ not being ruled out. 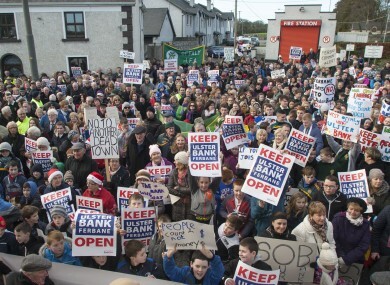 Email “These Offaly protesters don't want the only bank in their town closed ”. Feedback on “These Offaly protesters don't want the only bank in their town closed ”.